After being hunted to local extinction more than a century ago and unable to remember their ancestral calving grounds, the southern right whales of mainland New Zealand are coming home. A new study published today has shown for the first time that whales from a small surviving population around remote, sub-Antarctic islands have found their way back to the New Zealand mainland. Before the onslaught of 19th century whaling, historical records suggest that up to 30,000 of these impressive whales once migrated each winter to New Zealand's many sandy, well-protected bays to give birth and raise their calves. As a particularly social and acrobatic species, they could be seen from shore as they frolicked, slapped their tails and breached almost entirely out of the water. And now they're coming back, according to researchers from Oregon State University, the University of Auckland and other institutions. The findings were just published in Marine Ecology Progress Series. "We used DNA profiling to confirm that seven whales are now migrating between the sub-Antarctic islands and mainland New Zealand," said Scott Baker, associate director of the Marine Mammal Institute at OSU who initiated a study of these whales in 1995. "These are probably just the first pioneers," Baker said. "The protected bays of New Zealand are excellent breeding grounds, and I suspect that we may soon see a pulse of new whales following the pioneers, to colonize their former habitat." Because of their playful behavior and inclination to swim close to shore, Baker said, southern right whales have become a major tourist attraction in Argentina and South Africa, where their population has increased more rapidly. The right whales  three species are now recognized earned their names from the dubious distinction of being the "right" species to kill. They could be hunted from small boats launched from shore, they couldn't flee rapidly from approaching boats, and they floated when killed because of their large stores of blubber. The same characteristics that made them an ecological marvel also caused them to be sought by hunters. A large baleen whale, adult right whales can reach up to 60 feet in length and weigh up to 100 tons. Even calves weigh a ton, and right whales are thought to live for 70 years or more. 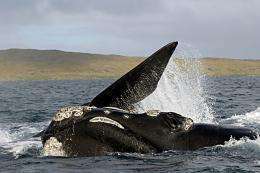 Hunting of right whales peaked in New Zealand and Australia in the 1830s and 1840s, the researchers noted in their report, and small remaining populations were further depleted by illegal harvest by the Soviet Union in the early 1960s. None were seen around mainland New Zealand for decades of the 20th century. A small population of this species survived, however, near the Auckland and Campbell Islands south of New Zealand in sub-Antarctic waters. But right whales have a strong "maternal fidelity" in which migration and calving grounds are passed along from mother to calf. Mainland New Zealand had once been a favored breeding ground, but once the last individuals there were killed, they didn't come back. "This maternal fidelity contributed to the vulnerability of these local populations, which were quickly hunted to extinction using only open boats and hand-held harpoons," said Emma Carroll, lead author on the study and a doctoral student working with Baker, who has an adjunct appointment at the University of Auckland. The researchers wrote in their report that "fidelity to calving grounds can be viewed as a type of cultural memory, and it seems the memory of the suitable calving ground can be lost along with the whales that formerly inhabited such areas." Just lately, however, a few right whales started finding their way back home. By 2005, there were estimates of fewer than a dozen reproductive females sited near the mainland, and there are still only a few dozen. But the new study showed that some of them definitely are coming from the sub-Antarctic islands  and more may follow. These studies have been supported by the U.S. Department of State, National Geographic, the University of Auckland, Marine Conservation Action Fund, and other environmental groups and agencies. Other collaborators are from the New Zealand Department of Conservation, Australian Antarctic Division, Macquarie University, and the Museum of Western Australia. "The right whale is remarkably graceful, very spectacular to watch," Baker said. "There used to be thousands of them in New Zealand and they are now re-discovering their ancestral home. It will be interesting to see what develops."